A seemingly impossible promise was extended to Abraham from above. God declared that Abraham, even in his old age, would yet have descendants through his promised heir that would exceed the number of stars in the sky and the grains of sand on the shore. And somehow Abraham, this friend of God, believed! Our belief in God's unique promises to us allows the heavens to converge with earth and bring our impossible dreams and yearnings to life. I hope we keep that child-like faith and Spirit-emboldened courage to count the stars and run our toes through grains of sand and cry, "The promise is mine!" and never let go. For truly, with God, all things are possible. "Come on up here and I'll show you the art of heaven." That was the invitation that transformed and changed the focus of the life of artist Janice VanCronkhite. Soon something amazing happened. God began flooding her with supernatural creativity and accentuating portals into heavenly realms of color, light, and design. 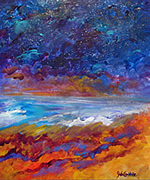 This fresh outflow allowed Janice to begin imparting a release of creativity into others as she spoke and painted in workshops and conferences across the United States. 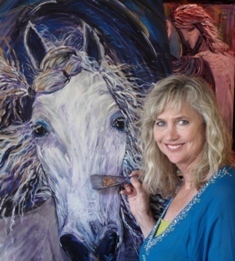 Now she she is taking creative impartation to a more in-depth and intimate level in her retreats at two "magical" locations: Fire Creek Mountain in Burnsville, North Carolina and Diamonds on the Lake, her studio gallery on beautiful Lake Oconee in White Plains, Georgia. There she helps others reach their own imaginative pinnacle by tearing down the walls that have kept them from exploring their own artistic journey of heavenly creativity. Janice is recognized for her bold energy on stage creating (painting), speaking and challenging the Church to be released into the fullness and anointing of God's intended creativity. In the end, her desire is to see His love and supernatural power exhibited through every kind of earthly artistic medium.